“Gourmandie” is the Normandy’s other name… That will take some doing ! 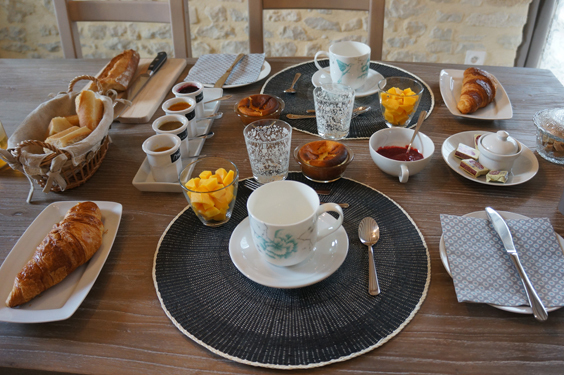 The breakfast is certainly a special moment during a stay in a Guest House. The perfect know-how to begin a new resting day with conviviality and for sense’ pleasure! 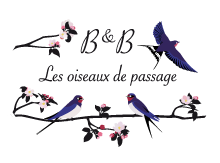 You will savour the home made products Hélène will have prepared for you. Different home made jams with suggestive names as ” l’insolite” ( could be translated as ” the unusual”), ” l”automnale” ( autumnal) , blackberry jam and others. Fresh cakes made every morning, as the cheesecake which has a great success! Different pancakes with maple syrup, or red fruits. Without forgetting breads, brioches, croissants from Isigny. And for sure, you will enjoy the regional products which make the reputation of Isigny, mainly those coming from Isigny-Ste-Mère dairy. The famous ” fromage frais lissé” coming nature or with maple sugar, red fruits. So tasty! Different local Norman cheese for the fan. AOP butter from Isigny of course! Apple juice made in a farm in Isigny. You will enjoy fresh squeezed juice every morning to get a glass of “energy” ! We will adapt ourself to special demand as in case of diets.